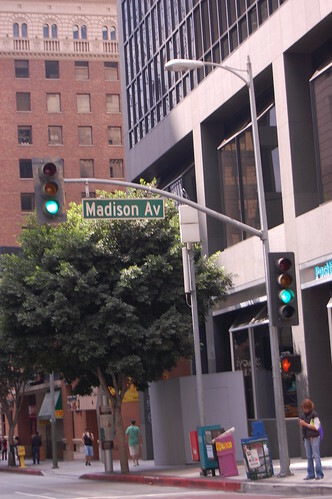 This is not Madison Avenue. This is the intersection of Wilshire and Flower here in sunny L.A. There were giant armored tanks and scores of actors in military garb down the street, too. But I can only snap so fast whilst in a moving vehicle. Just another typical weekend in my neighborhood. Gotta love it. awesome. i love driving by movie/tv shoots and wondering what's in production. they just filmed an episode of "heroes" in my 'hood a couple of weeks ago! A lot of filming goes on by my work too, and I don't mind or care too much unless it screws up my commute. I hope they don't meddle with your commute! ooohhhhhhh a military movie. I'll be skipping that one too, so someone will have to tell me all about WeeMo's apartment cameo.